That's the question University of Arkansas researcher Casey Brewster worked to answer in a recent paper published in the Journal of Herpetology. Brewster, a doctoral candidate in biology, worked with Steven Beaupre, associate dean of social sciences, and J.D. Willson, associate professor of biology, to link decades of fire suppression to changes in Ozark habitat detrimental to the lizards. "We know glade habitats have declined substantially over the last 100 years from fire suppression," Brewster said. 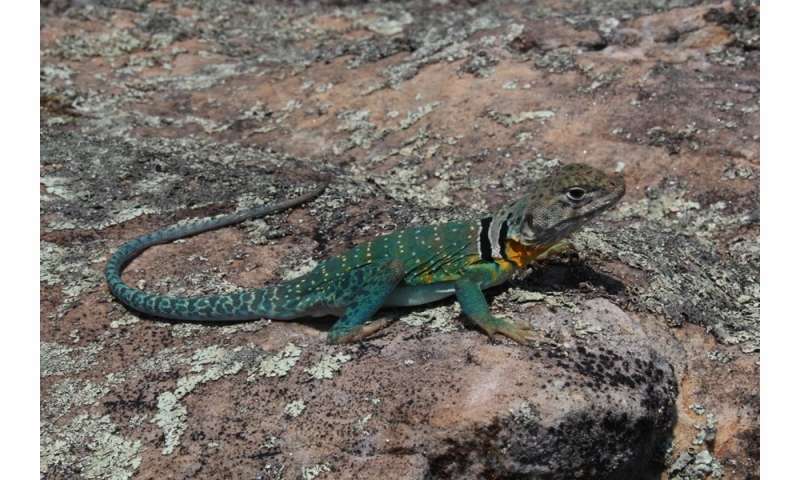 "We also know the collared lizard population is declining in Arkansas. Common sense tells you they are related, but if you really want to know how, you have to work out the mechanisms." "More shade equals lower temperatures and less surface activity for the lizards," Brewster said. "They spend less time at a body temperature at which they can digest food."